Cleans a whole set of balls at once! Every room owner knows that presenting a clean, inviting environment can be the best way to attract and to keep customers coming back. With the Carousel Ball Cleaner/Polisher by Creative Inventions, the last word in pool room maintenance is now the first word in quality equipment. The Carousel can clean and polish a whole rack of balls plus the cue ball at one time and in no time at all. The Carousel Ball Cleaner/Polisher runs on an ordinary 110 outlet, has a timer and variable speed control Simply spray your favorite cleaner on the balls, close the cover, lock it and go. Even old balls come out looking like new! 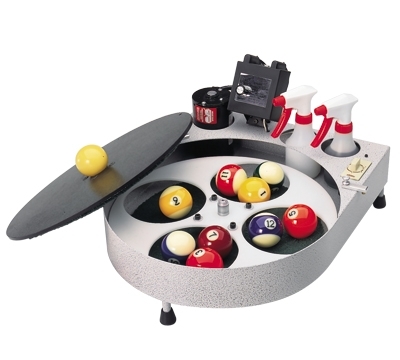 The Carousel cleans all sizes from snooker balls to Russian pool balls, easier and faster than ever before!